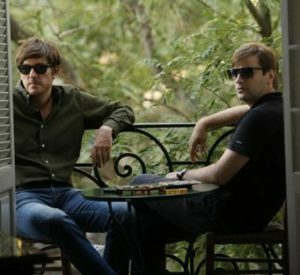 LIEBE are the Greek electropop duo comprising of George Begas and Dim Zachariadis. Hailing from the Hellenic art capital of Thessaloniki, LIEBE released their debut album ‘Club Royal’ in 2010. Their second album ‘Somewhere in Time’ came out on Undo Records back in 2012 and really did as the title suggested, harking back to a period when Giorgio Moroder and Bobby Orlando were models of dancefloor cool. Sitting on that difficult bridge between pastiche and post-modern, LIEBE’s love of synthpop and Italo disco continued on their third album ‘Airport’. The lead single ‘I Believe In You’ imagined PULP’s Jarvis Cocker joining PET SHOP BOYS circa 1987 and was accompanied by an alluring promo video which gained traction on MTV Europe. 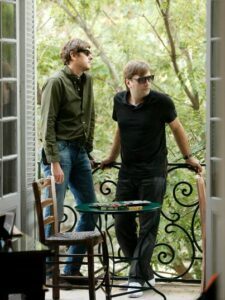 Their most recent album ‘Revolution Of Love’ developed on the sunny, holiday vibe of ‘Airport’ and has won the duo some new fans including Rusty Egan. Ultimately an optimistic experience shaded in melancholy, ‘Revolution Of Love’ is a wonderfully escapist pop record. LIEBE vocalist George Begas kindly chatted to The Electricity Club about the duo’s career so far. LIEBE’s music has a very retrospective visual element to it, as well as being danceable? We think that our music is not dance music, some songs have a high tempo but the core and melody gives more of a radio pop friendly character. ‘Flamingo Nights’ is a different side of the music we like. We try to sometimes sound a bit different from our main electropop sound. It is a song written in an easy listening mood with us thinking of Burt Bacharach and Stan Getz. Who are LIEBE’s main musical influences? Main musical influences? 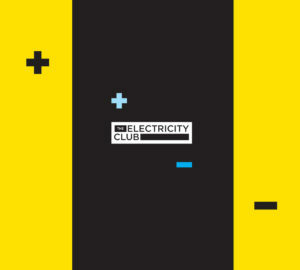 Hmmm… from disco to easy listening and electro 80s music to indie pop and new wave, both of us like similar bands and sounds. Is the musical vibe of LIEBE almost inevitable when you are living somewhere that is sunny? In Greece, the sun is shining a lot and gives us a feeling of a free spirit. With a more easy going style of everyday life, the music we make could lead to bossa nova and easy listening summer grooves. But unfortunately our music is full of dark and melancholic areas with slow drums and chaotic synths… it’s not the sunniest music you can hear. Is the Jarvis Cocker afflicted droll in the vocals accidental, like on ‘Meet The Stars’? We both like PULP and sometimes we pay a bit of a tribute to the voice and maybe some lyrics. That had more of a preaching style, but there is some Jarvo into it. What makes Italo disco so maligned by some, but loved by others? Italians do it better I suppose, this 70s piano music that makes the people dance is back in a fresh new edition. A flashback to music is always welcome, especially with such super sounds. ‘I Believe In You’ is possibly one of your best songs and a good introduction to LIEBE. How was the song conceived? It’s just another song we have written for our third album, I can say that it has all the elements and sounds that LIEBE is fond of. Thank you for the compliment, but it’s hard for us to rate and to put in a favourite scale to our songs, but it is definitely one of our favourites. The video for ‘I Believe In You’ proved to be very popular on MTV Europe. Where did the concept come from? We asked a dance school to make a choreography for the song; the idea was to make something different from our other video clips and to avoid our own main role on the screen. The girls did a fantastic job and gave a nice view to our music. SARAH P. who was in KEEP SHELLY IN ATHENS says there is not much of an electronic music scene in Greece, what do you think and how has that helped or hindered you? Music in Greece or the music industry in Greece is pure Greek lyrics and R‘n’B, hip-hop and traditional bands. There is a music scene in Greece playing pop, indie, new wave and electro but the audience is limited. Radio, TV and magazines give a poor recommendation to bands like that. However, we have an international view for our music. Your most recent album, ‘Revolution Of Love’ perhaps has an indirect political message too? Has the economic mood in Greece had any effect on the music you make? Things in Greece over the last few years are not the same as they used to be. The bad economy gives a really hard time to the society and us. The idea was to make a revolution made by love and for love, let’s make a revolution for a good reason, pure and crystal love with a will not for a need, but peace and togetherness. The problems in our country had no effect to our way of writing songs and to the feelings behind them. LIEBE have explored some new directions like on ‘The Box’ which sounds a little like JEAN-MICHEL JARRE? ‘The Box’ has these synths and pianos of Jarre, but the chorus goes a bit NEW ORDER in their ‘Regret’ era. With dark and big synths, it’s one of our good ones in our live set. ‘Sound Of The Moments’ explores a more house based club direction? It’s our dancey song on the album, a bit of PSB kind of singing, like telling a story about flirting in a bar under this music. The end has a more classic summer feeling with the trumpet leading the way to the end. You both undertake a variety of projects outside of LIEBE? Dim is writing songs for his personal project, in a dancey, slow disco, funky style with some Italo moments. I make some pop songs, indie stuff and a bit of easy listening guitar music.